Tax can be understood as the monetary obligation charged by the Government on income, activity or commodity. It is collected in order to serve the basic purpose of providing revenue to the government, so as to fulfill social and economic objectives. The tax is levied both on physical and non-physical items. Here, we are talking about indirect taxes which are imposed on goods and services. The tax charged on goods is known as Value Added Tax (VAT), whereas only Service Tax is charged on services. The contributes the highest proportion of earnings to the government is VAT and Service Tax. While the former is imposed by State government, the imposition of the latter is under Central Government. There are many individuals who are still unaware of the differences between VAT and Service Tax, so here we have an article for you, take a read. Meaning Tax charged on the value addition to commodities is known as VAT. Tax charged on the services provided is known as Service Tax. Charged on Both on production and trading of goods. Services provided. Rate Variable, for different types of commodities Uniform for all services. Area Within the state All over the country subject to certain exception. VAT is an abbreviated form of the term Value Added Tax. As its name suggests, it is a tax on value addition made to a particular commodity by a party at the time of its production and distribution. The taxpayer will get input tax credit for the tax already paid on the product at the previous stage, i.e. set off is available to the taxpayer for the tax paid on the preceding stage. The right to levy VAT is in the hands of the State Government; that is why it is imposed only when the sales are made within the state. Central Sales Tax is charged in case of interstate sales. It is also known as the multilevel tax because it is levied at each stage of the supply chain of raw material, whenever the value is added to the product, till it is sold to the end consumer. The burden of VAT is borne by the customer itself but paid by the seller to the tax authorities. VAT can be easily calculated by simply deducting input tax from output tax where input tax is the tax on intrastate purchases from a registered dealer while output tax is a tax on intrastate sales. More than 160 countries of the world had adopted the VAT system. In India, the VAT rate varies from state to state. However, it is 0% for tax-free commodities, 1% for precious stones, jewellery, etc., this, 4% for necessities, 20% on luxury goods and 13.5% on all other goods not falling into the above categories. The tax charged on the services provided is known as Service Tax. The Central Government has the authority to levy service tax, so it is applicable in the whole country except the state of Jammu & Kashmir. The tax liability for the services can be determined from the Point of Taxation. Normally, the person who renders services is liable to pay service tax, but the burden falls on the service receiver. Although there are some notified services on which the tax is to be paid by the service receiver itself, this is known as a Reverse Charge Mechanism. Furthermore, there are some services on which the tax is to be paid by both service provider and service re; this is known as a Joint Charge Mechanism. In India, the service tax was first introduced through the Finance Act, 1994, recommended by the Dr Raja Chelliah Committee. At that time it was levied only on three services, i.e. stock broking, telecommunication, and insurance, at the rate of 5%. At present, the rate of service tax is 14%, and it is levied on all the services except those which are included in the Negative List. The Negative List is the list of the selective services which are exempt from tax. The tax imposed on the production and sale of a commodity is known as Value Added Tax (VAT). Tax on services rendered is known as Service Tax. VAT is a multi-point tax, whereas Service Tax is a single point tax. VAT is charged on physical items i.e. goods while Service Tax is charged on non-physical items i.e. services. The State Government imposes VAT, but Central Government imposes services Tax. VAT is governed by the statute of the respective state. On the other hand, Service Tax is governed by the Finance Act, 1994. VAT was introduced in the year 2005, all over the country. Conversely, Service Tax was introduced in the year 1994. The VAT rate is different for different category of commodities. In contrast to Service Tax, has a flat rate. VAT is applicable within the jurisdiction of the state, whereas Service Tax is applicable all over the country except in Jammu & Kashmir. 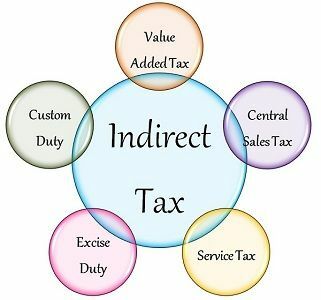 Both the VAT and Service Tax are indirect taxes; that is why they are under the control of Central Board of Excise and Customs (CBEC). However, Goods and Services Tax (GST) is going to replace the VAT and Service Tax in India in the next few years after which a single Act will govern both the taxes.